Today’s post is a one-off analysis of the implications of Donald Trump becoming President of the United States. The regular Weekly Roundup will appear later in the week. The big news last week was that Donald Trump won the US presidential election, defying the opinion polls. 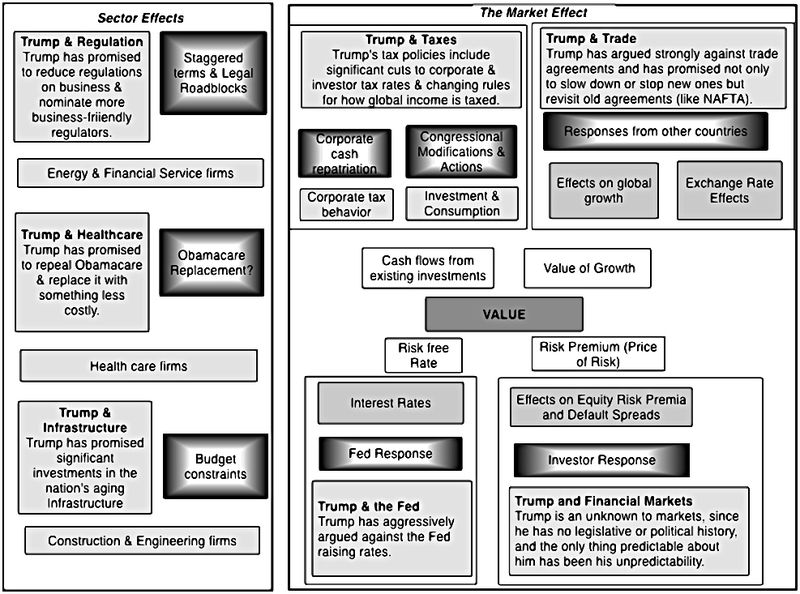 Today I plan to focus on the economic, financial and investing implications of the Trump presidency, but first let’s get the politics out of the way. Trump’s victory is less a vote for a particular man and a particular set of policies, and more a vote against a smug ruling elite. It’s a vote for change, but not for a particular change or set of changes – there is more than one path forwards. I personally hope (but doubt) that it represents the lancing of a boil that can allow a productive conversation to begin between both sides. It’s worth saying that, given the results of recent elections in the UK – the 2015 general election and the Brexit vote – this result isn’t the shock that it’s being portrayed as in the mainstream media. Plenty of the people I follow on Twitter thought that Trump would win, and most thought that the election would be a lot closer than the polls suggested. So long as the left continue with their focus on identity politics and with pushing a globalisation agenda that helps those in developing countries more than the poorer workers in western nations, they run the risk of losing votes. Forthcoming elections and referendums in Italy, France and Germany could deliver similar results, making the outlook for European shares – and for Europe itself – uncertain. The reason that a Trump win seems like a surprise is that the media themselves are left-wing, and so incapable of seeing that their favoured candidate might lose. They are certain that they are the “good guys”. News today is an echo chamber of people repeating the same message, and social media is even more filtered and self-reinforcing. People curate the media that they want to hear. Investors in particular would be well-served by ignoring people’s political views and mixing things up a little. Obviously, given Trump’s track record of changing his mind, we can only guess which policies he will actually enact. Trump himself has said that he is “totally flexible on very, very many issues”. We also have to wonder which policies he can get through Congress. The Senate and the House are both Republican – as are the majority of governors and state legislatures, and the Supreme Court soon will be. But there is a difference between Republican and Trumpian, and many in the party do not support him. Most Republicans want free trade, a smaller state and no budget deficit. Trump’s choice of Reince Priebus as his Chief of Staff seems designed to ensure better relations with Congress. Beyond policy and legislative uncertainty, it’s impossible to imagine how Trump might react to future crises as yet unseen – the “unknown unknowns”. And we have the likelihood that the next US recession (already long-overdue, some say) will strike on his watch. That said, there were two big messages from his campaign. This first was trade protectionism to boost US jobs. This is aimed particularly at Mexico and China, with collateral damage to Canada from any changes to NAFTA (let’s ignore The Wall for now). China owns a lot of US financial assets (particularly US Treasuries) that they could dump, but I’m not sure that Trump would see that as a big problem. He’d need to find someone else to buy the bonds he will need to issue, but as a last resort that could be the Fed. The Chinese could also buy European goods instead of US ones, and add retaliatory tariffs to tech goods like iPhones. The Pacific Rim countries would be affected if Trump breaks up that trade deal as well. Interestingly he seems interested in a new trade deal with the UK. The second pledge was fiscal stimulus, which appears to be largely increased spending on infrastructure – once thought to be perhaps $2 trn or 3% of GDP, but now looking like it will be “revenue neutral” – plus tax cuts for all individual taxpayers, as well as companies. Amnesties for the repatriation of corporate dollars overseas would provide a further fiscal boost. It’s a strange mix – free market-style taxes, but not free markets, and centralised planning on infrastructure spend. A trade war could be bad for all economies including the US perhaps, but particularly for Mexico and Canada – we won’t know until we see all the details. Even Spanish companies with links to Mexico, like BBVA and Santander, have suffered already. But small increases in tariffs here and there might have little effect. Emerging markets might struggle if there is a flight to quality. The same logic in reverse might underpin the gold price. And Russia could do well – it’s cheap, and Trump and Putin will probably cooperate in some way. The fiscal stimulus and tax cuts should be good for most US companies in the short-term, though with unemployment low at 4.9% there is a risk of inflation and therefore of rising interest rates, which means that longer term prospects for US stocks are uncertain. I think this could be somewhat offset by people rejoining the labour force – the US participation rate is at record lows. The low rate of growth in productivity is another indicator that the economy is actually running below capacity. 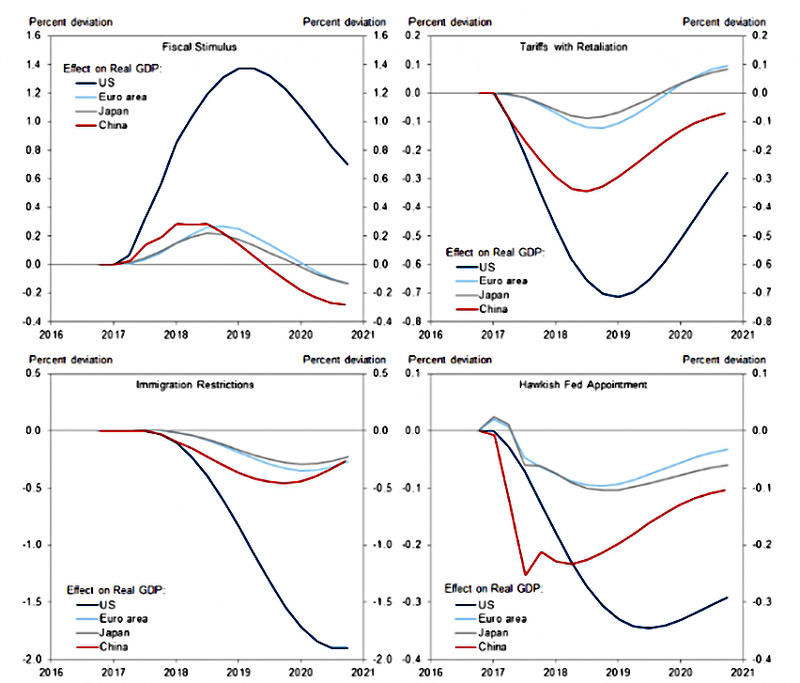 Tax cuts at the bottom end will multiply the stimulus effect on demand growth, but those for rich people and companies will have little positive effect, and will instead lead to more savings, more debt and higher future deficits. The stimulus will also lead to increased deficits and a higher national debt, funded by issuing more bonds at a time of potentially rising interest rates (and hence greater costs to the government). Even if inflation doesn’t push up interest rates, Trump has accused the Fed of keeping rates artificially low and so can be assumed to want higher rates anyway. Higher rates should support the dollar, but the increased borrowing will do the opposite. Overall, it’s hard to reconcile a stimulus package designed to increase GDP growth back to pre-crisis levels with higher trade tariffs likely to dampen demand. Current forecasts for the US national debt in 2026 are 86% of GDP (up from 77% today) – Trump’s policies could increase that to 105%. As we saw a couple of weeks ago, the UK government currently pays interest of 6% of total government spending on a national debt that is 223% of government revenues and 209% of government spending. This implies that the UK debt is currently 89% of GDP, and the interest paid on it is 2.6% of GDP. This in turn means that the average interest rate paid by the UK is almost 2.9% – there must be quite a lot of outstanding debt issued at rates higher than those prevailing today. I don’t know what the US’s current average rate of interest is, but a national debt of 105% of GDP and average rates of 3% or more would probably mean that Trump was heading into uncharted territory. Defence stocks look to do well, because Trump may spend more on defence – he mentioned a bigger Navy, but he might also encourage his NATO partners to buy more US armaments. Trump will repeal Dodd-Frank, for example, and has promised less business regulation in general. Infrastructure stocks (construction, engineering and raw material firms) should also do well because of the stimulus spending. Fossil fuel energy companies might do well if Trump backs out of the Paris climate change treaty. Green energy companies could do badly for the same reason. Tech stocks could drop because of their Asian supply chains, which may come under pressure. Trump has also said that he sees Amazon as an anti-trust (monopoly) situation. Utilities could struggle under higher interest rates, but banks should do well. Insurance companies and hospital stocks could struggle if Trump repeals Obamacare. Trump’s win has major political implications, particularly for Europe, starting with Italy and France. There are also big geopolitical implications, with the US potentially retreating to leave a role for Russia and Japan as regional powers alongside China. For investors, the picture is less clear. Trump has policies with conflicting implications, and his track record of changing his mind means that we don’t really know which ones he will will implement. The big news is that we are probably at the start of a new interest rate cycle, with more than 30 years of falling rates coming to an end. Even Harry Kaufman – the original Dr Doom from the 1970s – says so. That’s bad news for bonds, but not particularly good news for stocks. Stay tuned for developments as Trump picks his team and signals his intentions. Until this happens, markets could be volatile, as uncertainty is the one thing they don’t like. This uncertainty, and the delay it causes in investing and borrowing, is the only thing that seems dis-inflationary about Trump. But we may have to wait a while to see the other side of the coin. Next story Profit Warnings – What Should You Do?